Bring whatever you are working on to a reference librarian and get immediate expert assistance in finding the information you need, whether it be articles, statistics, company information, or books. You will walk away with the source or two (or three) that you need! Monday, February 25th 2:00 p.m. to 3:00 p.m.
Tuesday, February 26th 2:00 p.m. to 3:00 p.m.
Thursday, February 28th 5:00 p.m. to 6:00 p.m.
Research Instruction Center (RIC), Room 11, on the lower level of the library. No RSVP necessary – just drop in to the library’s classroom (room 11) anytime during the sessions. Don’t forget, librarians also provide research help 7 days/week at the Reference Desk. Visit, email, call, text, or IM/chat with a librarian whenever the Reference Desk is open. 2:30 p.m. to 3:30 p.m.
Why do your professors want you to cite your sources? Does it feel like busywork? Let us help. We’ll show you how to cite your sources in the format of your choice, and where to find citation templates and formatting style guides. Do you have sources you need to cite, or a bibliography you need help with? Bring them with you and we’ll provide on-the-spot assistance. To reserve your seat, send an email to refdesk@bentley.edu with “Citation Workshop” in the subject line, and tell us which session you’d like to attend. Having trouble finding quality sources? Come to a drop-in workshop developed specifically with you in mind! The Bentley Library is offering workshops to help students find and identify quality sources. Monday, November 13: 2:00 p.m. to 3:00 p.m.
Wednesday, November 15: 12:00 p.m. to 1:00 p.m.
Friday, November 17: 2:00 p.m. to 3:00 p.m.
No RSVP necessary; just come to our classroom, room 11, on the lower level anytime during the hour. Tuesday, April 18th, 5:00 p.m. to 6:00 p.m.
Thursday, April 20th, 2:00 p.m. to 3:00 p.m.
Sunday, April 23rd, noon to 1:00 p.m.
We Are Here to Help! Visit, Call, Email, Text or IM a Librarian. Reference librarians are available 7 days a week to answer your questions and provide research assistance. It’s easy to connect with a librarian in person, on the phone, via email and by IM/chat! Full details, including our hours, contact information and the “Ask Us” chat widget are available on the Research Help page. 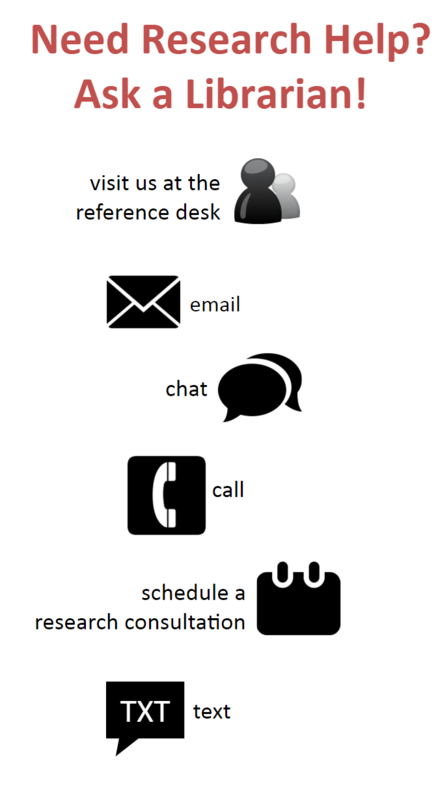 Schedule a Research Consultation with a Bentley Librarian! Reference Librarians are, first and foremost, researchers, and the Bentley Librarians have a particular expertise with the content, collections and scope of the resources available at Bentley University. We are here to help you achieve the goal of an excellent paper or project. Many of these activities can be done directly with a librarian at the Reference Desk, but booking an appointment can help save you time and will help you get the most out of the resources available to you. First year student working on a pro/con paper. Upperclassman working on an honors capstone thesis. Student researching a company in preparation for a job interview. Graduate student team working on a strategic marketing plan. PhD student working on a dissertation. Professor working on her/his own research or curricular design. Click here to schedule a one-on-one research consultation with a Bentley Reference Librarian! Consultations last about 30 minutes to an hour depending on the needs of the user and take place during normal Reference Librarian hours. Consultations need to be booked with at least 24 hours advanced notice for users to make the most of these sessions. For more immediate assistance, help is also available at the Reference Desk.